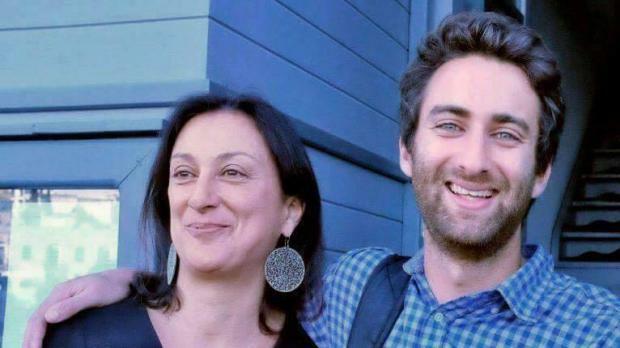 The son of slain journalist Daphne Caruana Galizia, Matthew, has taken to social media to appeal for information on the account held by the once-secret Dubai company 17 Black. In posts on his profiles on various social media platforms, including Facebook, Twitter and LinkedIn, Mr Caruana Galizia said that he was now in possession of the account numbers and required the assistance of anyone with information to trace payments. He appealed for assistance tracking payments to and from what he alleged was “a slush fund for corruption operated by Electrogas owners. Now we have the account numbers. You can help us starting by sharing this. “These are the details of the account in Dubai used for multi-million dollar bribe payments,” Mr Caruana Galizia claimed in a Facebook post. “Show us what you can do.” He shared a similar post on his LinkedIn profile, in which he addressed “financial professionals, lawyers, compliance staff, prosecutors and law enforcement officers”. In this post, he goes on to refer to the slush fund as that which “[his] mother Daphne was investigating when she was assassinated with a car bomb”. According to him, the account holder is either Wings Development Ltd or 17 Black Ltd and is registered in the Ajman Free Zone, a free trade zone in Ajman, the United Arab Emirates, at the Noor Bank. Mr Caruana Galizia also included the name of the beneficial owner, power station investor Yorgen Fenech, as well as a number of the account’s IBANs for various currencies. Last year, in a joint investigation with Reuters, the Times of Malta identified Mr Fenech, Electrogas power station investor and businessman, as the owner of the mystery Dubai company. 17 Black was named in leaked e-mails as one of two companies that would pay $2 million to the Prime Minister’s chief of staff Keith Schembri’s and Tourism Minister Konrad Mizzi’s Panama companies. While Mr Schembri has said he was unaware of who owns the Dubai company, the Tourism Minister has insisted he has no connection to 17 Black. Mr Fenech denies any wrongdoing and links to Panama companies.